Here are short and clever pieces by thirty contemporary Australian writers on topics ranging from the eroticism of mash potato, parenting as magic realism and a tongue-in-cheek history of the Cyclops bicycle. Each one is a creative blast straight from ‘brain stem to pen’ with ideas and insights that will blow your mind. Contributors include award-winning writers Michael Farrell, Keri Glastonbury, Judith Beveridge and Peter Boyle. 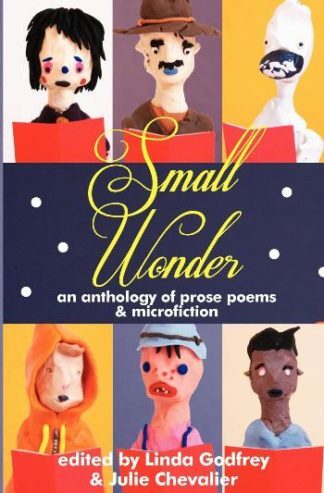 Features prose poems and microfiction selected by joanne burns for the inaugural joanne burns Award. Cover design and illustrations by Paden Hunter. joanne burns writes poetry [including prose poems], monologues, and short futurist fictions or farables. She has been writing prose poems joanne burnsblogsince the late 1970s. Since 1972 many collections of her work have been published, the most recent being ‘an illustrated history of dairies’ 2007, and ‘amphora’ 2011, both published by Giramondo Books. ‘kept busy’, a cd of joanne burns reading a selection of her work, was released in 2007 by River Road Publishing. Prose poems from ‘on a clear day’ UQP 1992, an ETT Imprint book since 1997, are included on the current NSW HSC English syllabus. She is working on assembling a Selected poems collection, and on a new poetry collection ‘brush’.